This is a rare example of a Adams leg iron. 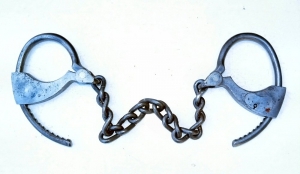 The Bean Cobb leg iron is much less common than the handcuff. 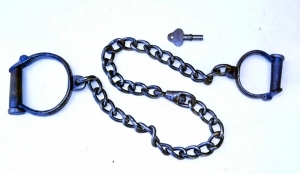 It shares the same removable lock mechanism. 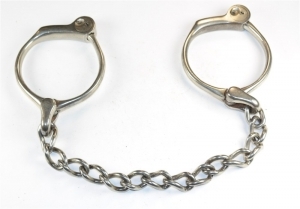 The Bean leg iron is a larger version of the popular Bean prison handcuff. 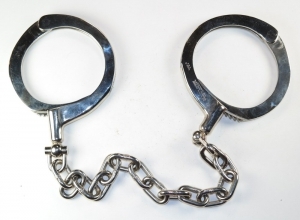 These are a larger version of a Bean Prison handcuff. 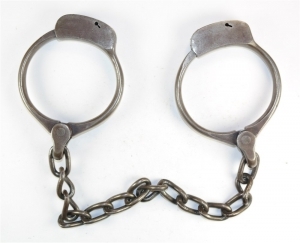 The Delestatius leg iron is the leg iron version of the Delestatius handcuffs patented in 1861. 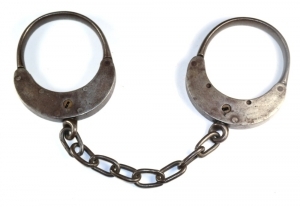 The so-called Dollar Handcuff has a unknown origin. 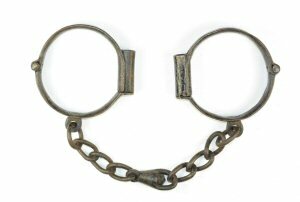 It is likely an early 20th century German cuff. 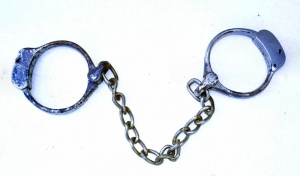 This is a single ER shackle. It matches the cuff found on the ER leg iron. This leg iron is marked for Field of Holborn Street, London. It was likely made by Hiatt. 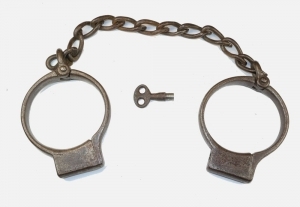 This Froggatt combination has two leg irons and one handcuff. This is a standard Froggatt leg iron. 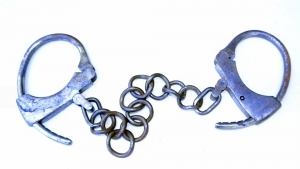 This Froggatt leg iron has the long chain and central ring common to many early 19th century irons. 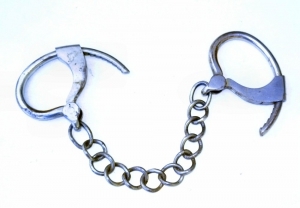 The H&R Super handcuff is pretty common, but the leg iron is a rare item. 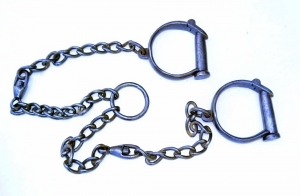 The Harvard leg irons were produced in huge quantities for the military in WWII. 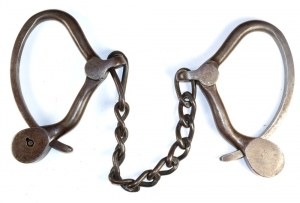 This is rare example of the Hiatt version of the American Bean leg iron. This is a standard Hiatt leg iron. 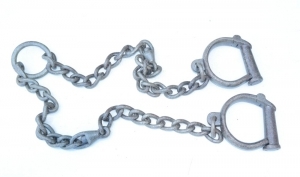 This is a long chain version of the Hiatt leg iron. 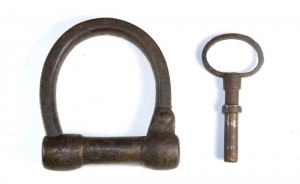 This is a very rare Hiatt plug 8 leg iron from the 19th century. A rare and valuable item. 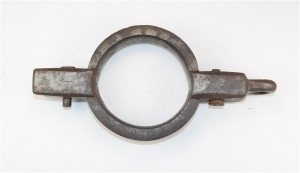 This is a Hiatt plug eg iron from the early 19th century. This is Judd leg iron by Mattatuck. It takes a round key. This is the Lily leg iron. This is Lovell version of the Bean legiron. Mattatuck Leg Iron - A rare item. 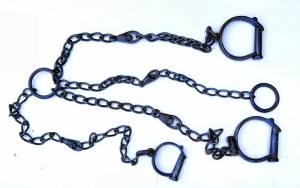 This is the Nichols version of the early 19th century long chain leg iron. This is a heavy plug leg iron made by Nichols. The Palmers came in five sizes. 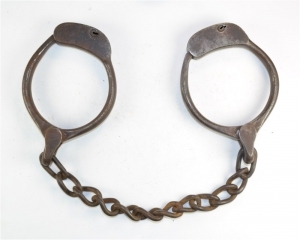 This is a mismatched set of Palmer leg irons. 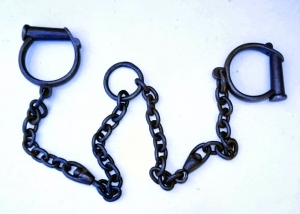 This is the Parker version of the early 19th century long chain leg iron. 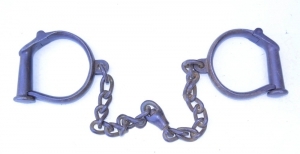 The Providence Tool Co of Rhode Island made cuffs during the US Civil War era. 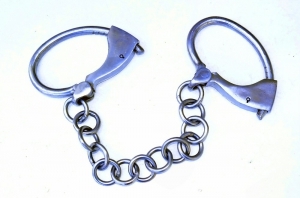 The Romer leg iron is just a larger version of the handcuff. 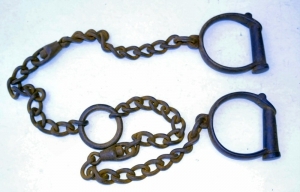 This is a very rare Runquist shackle patented in 1872. 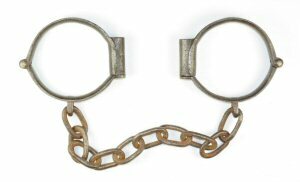 This is the original patent model. 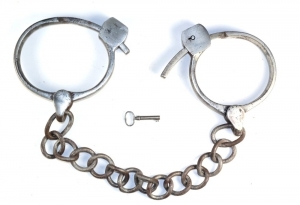 It fastened with rivet. 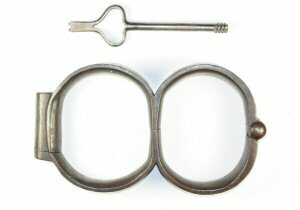 This is a standard Security Manufacturing Co. Leg Iron. This entire cuff was covered in green paint at one time. 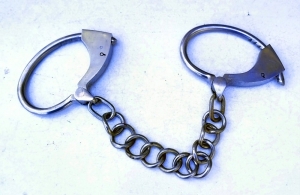 Thompson standard Darby handcuffs are somewhat common, but other items like this leg iron are scarce. This is the first Tower leg iron. It takes a bottom key. 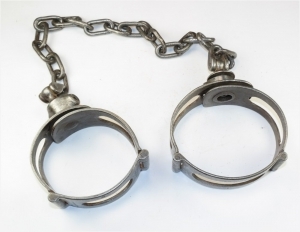 This is the leg iron version of the popular Tower Detective handcuff. These are rare items. 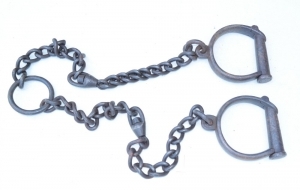 This Tower Leg iron has a standard chain instead of the normal linked rings. A nice example of a Tower leg iron. 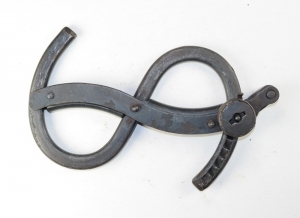 This version of the Tower leg iron has round rings. Often said to have been made by Balco. 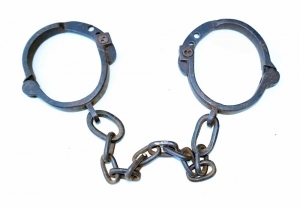 These plug 8 leg irons are covered in black paint which cover any possible markings. This is an unusual leg iron. It adjust to different size my screwing in a screw that take a normal two pronged plug 8 key.